Passengers from Azul Airline have free shuttle to the Viracopos airport from São Paulo at various times, departing from the Congonhas Airport, Shopping Eldorado, Shopping Tamboré and Barra Funda Bus Station. There are also buses to various parts of São Paulo, Santa Bárbara D'Oeste, Sorocaba and Piracicaba. 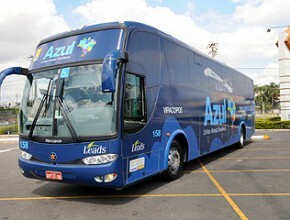 To check timetables and places of departure and arrival, visit Azul website. NOTE: The information of the lines, tariff prices, estimated time of travel and departure timetables of buses were obtained from the companies responsible for transportation. We are not responsible for possible consequences of errors or omissions. Please contact the companies responsible for transportation service in case of doubt or to update the information.